You are currently browsing the Western Custom blog archives for August, 2010. When a toilet begins giving flushing problems, there are several ways to troubleshoot the problem. If the tank is filling properly, but the waste water is sluggish to go down the drain easily, this indicates a clog in the toilet trap itself, or some kind of blockage in the drain line. A handy tool known commonly as a “Plumber’s Friend” or toilet plunger, is often all that is needed to resolve the problem. This tool, used properly, forces air pressure down the base of the toilet, many times providing just enough extra force to push the clog or obstruction from the trap, and down the drain. It is advisable to keep one of these on hand near the toilet for that unexpected, and potentially embarrassing situation. Other situations may call for more extreme measures. Kids have a propensity to allow their curiosity to get the better of themselves. Many times a stuck toy, or other object not designed to be flushed down a toilet, becomes the culprit. This may be extreme enough to require removal of the toilet to remove the object. A clogged main line on the drain system is more rare, but does happen on occasion. Tree roots, and other things can contribute to this problem. In this situation, it is advisable to call a professional plumber. They have the proper tools to deal with this situation. A full septic tank might also be a culprit. This also requires professional assistance. 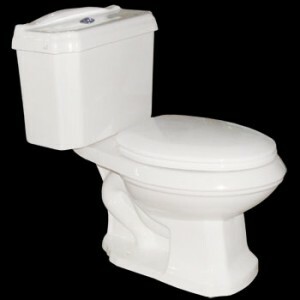 Newer Dual Flush Toilets, (1.6 or .8 gal flush) are designed to flush easily with either solid or liquid waste. Liquid waste requires less water, and is energy saving as well.